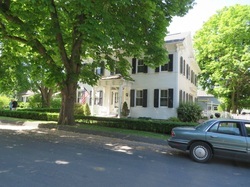 137 West Pine Street is a five‑bay white house that was built by wealthy retired farmer George Sheneberger Jr in about 1870. He lived there with his wife Rebecca, daughter Catherine, and servant Lydia Markle until his death in 1871 when the property passed to his widow. After her husband’s death her son John C. became a tenant and in 1880 he left and tenants John Rupp and David Keller moved in. Sarah Moore another widow purchased the property 1n 1882 and lived there until 1903. The main portion of the building is a gabled two and a half storied structure. There is a two story gabled extension and a one storey gabled extension at the northernmost end of the home. With the exception of the attic windows, all of the windows on the main building and the first extension are two over two sash with navy blue shutters. Paneled shutters surround the first floor windows; those on the second floor windows are louvered. The second extension features two over two-sash windows without shutters and Italianate lintels. The siding of the house is white original wooden clapboard, which varies in width and tends to get narrower towards the top of the building. Italianate scroll‑sawn brackets decorate the cornice and gables of the main building, as well as the cornice of the first extension. The east eave side has a recessed porch decorated with Italianate scroll‑sawn brackets. A second porch is at the south‑facing gabled end of the main building. Four columns decorated by Italianate scroll sawn brackets support its roof. The Italianate‑paneled main door features a transom and two sidelights. The first floor of the building follows a plan common in Boalsburg at the time: two rooms with a central stair. The owners reportedly used the western room as a parlor, and the eastern room as a dining room. The central hall leads to a kitchen with an adjoining pantry. The second floor has two rooms on the western end of the main building and a hallway to the eastern end, with attic steps in the middle. The eastern end has three bedrooms, a bathroom, and two unheated rooms at the north end of the second extension. Three windows, all made of original glass, bring light into the attic. The attic also showed evidence that the house is a plank house, with planks seeming to extend from the sill all the way up to the peak of the gable. The house never had fireplaces; instead, the owners relied on stoves for heat. Stovepipe holes were located at the east and west ends of the main building and in the north gable end of the second extension. The interior of the home has many original aspects to it. The molding and doors are original, as are the iron door latches that are found throughout the second floor. Unique original glass transoms surmount select doorframes on the second floor. The central stair features original and hand‑made balusters, each looking slightly different than the other. The kitchen features a Germanic holdover in the form of a similar original built in cupboard in the house at 229 East Main Street, Boalsburg.